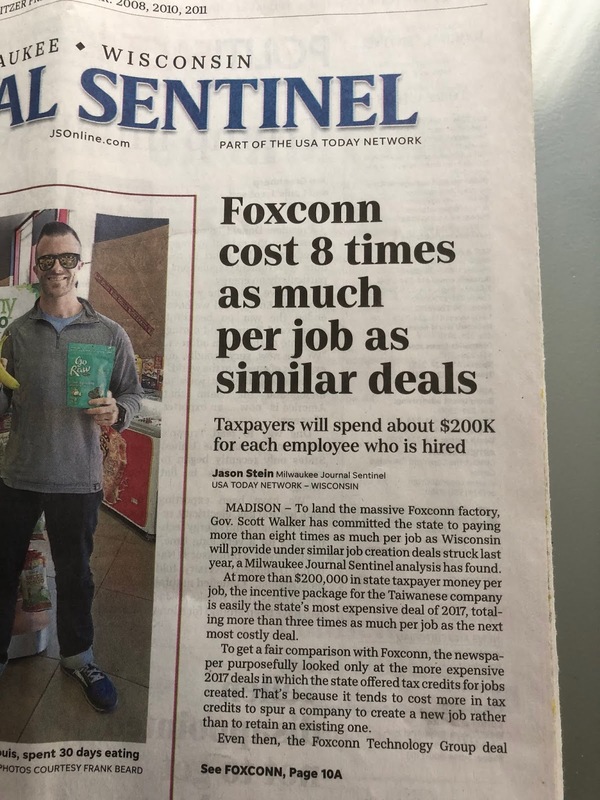 The paper interviewed an expert who said Wisconsin was paying a hefty premium. Timothy Bartik would answer the question this way:"It's unclear if the benefits would ever be as great as the incentive costs," said Bartik, senior economist at the Michigan-based Upjohn Institute for Employment Research who studies subsidies. "It was a very unusual deal." Tim Bartik, an independent economist who studies economic development, said Wisconsin is paying many times more per job than he typically sees in other projects nationally and is even shelling out more than some states were willing to pay per job for the much-hyped Amazon headquarters. Amazon Is Getting $1.5 Billion to Come to Queens. Now Begins the Fight Over if It’s Worth It. The state also offered a capital grant to the company that could total as much as $500 million that Amazon can use to build new offices. Foxconn itself has been more circumspect on the number of jobs it will create, saying in a press release it will “create 3,000 jobs with the potential to grow to 13,000 new jobs”. Even if 13,000 new jobs are created, Wisconsin would be paying $346,153 per job at a subsidy of $4.5bn. An astronomical sum, but nothing compared to the $1.5m per job cost if the deal ends up creating just 3,000 new positions. Updated, 12:00 p.m. Not to mention Virginia, which gets 25,000 Amazon jobs at the company's other new HQ locale for $819 million! 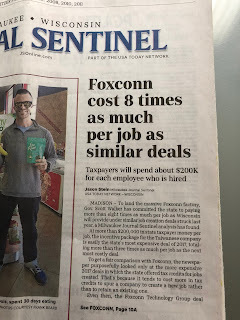 And all the Amazon jobs are supposed to average $150,000 annually, while Foxconn's have to hit about $54,000. So which state got a better bang for its public bucks? These links and 275 more are in this Foxconn blog archive.